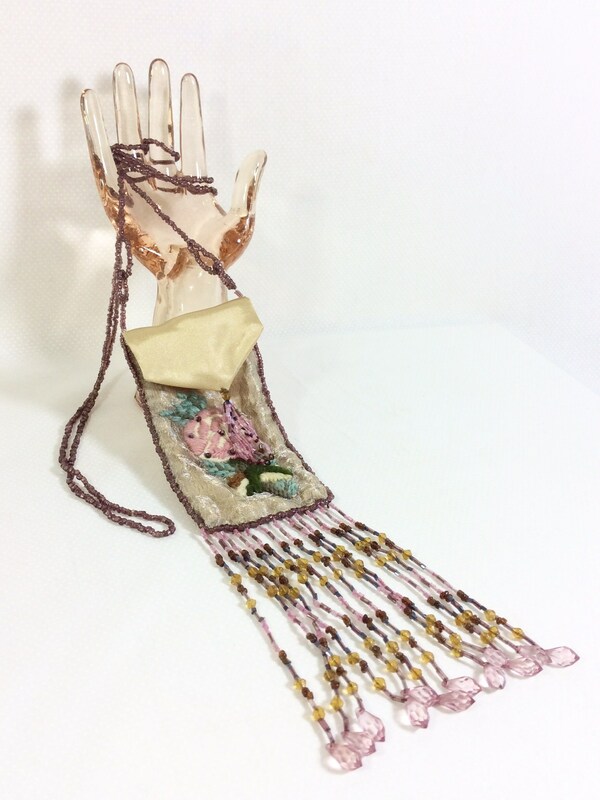 Stun your friends and family with the sight of this rare and beautiful pouch necklace! 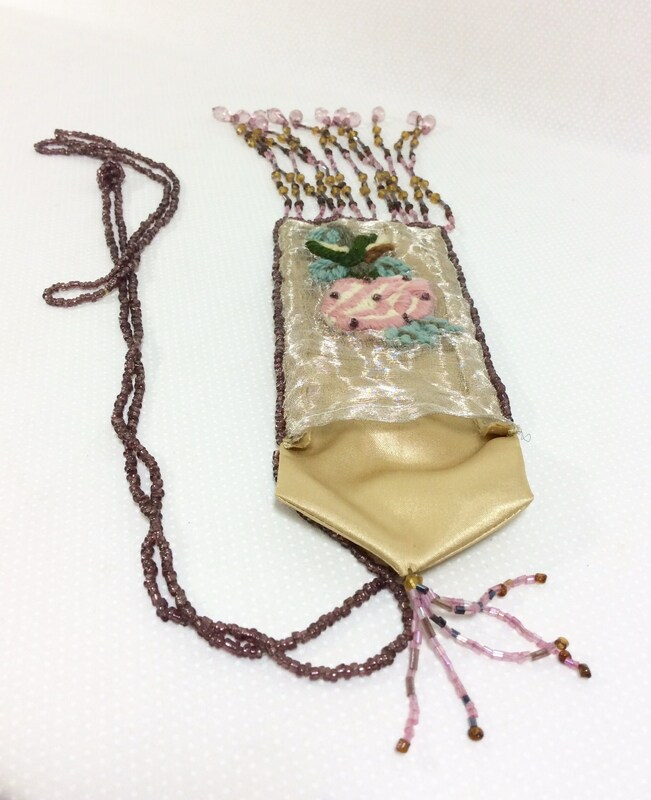 This gorgeous accessory was made during the 1920s. 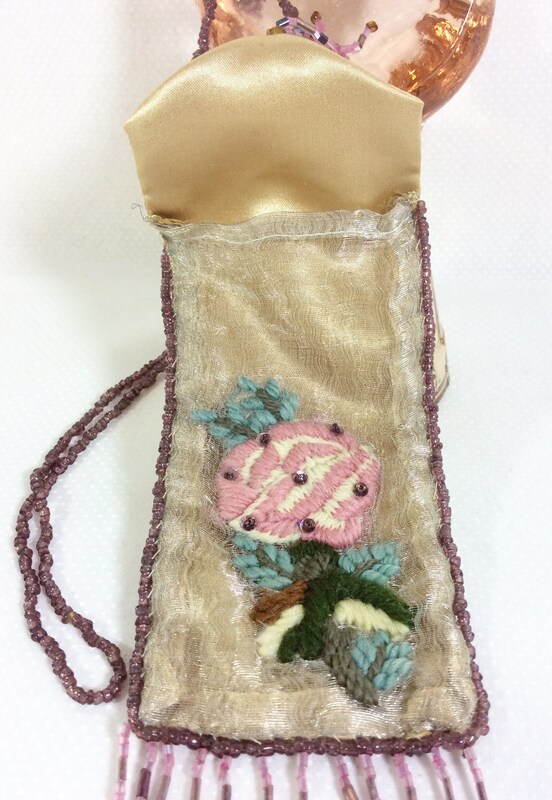 The pouch is made of silk and satin with embroidery, adorned with loads of intricate beading details. The purse sautoir necklace is extremely rare. Due to the delicate materials used to make them, most of these necklaces did not survive the ravages of time. Those remaining are highly sought after and usually only seen in films. The purse portion of this necklace is exquisite. 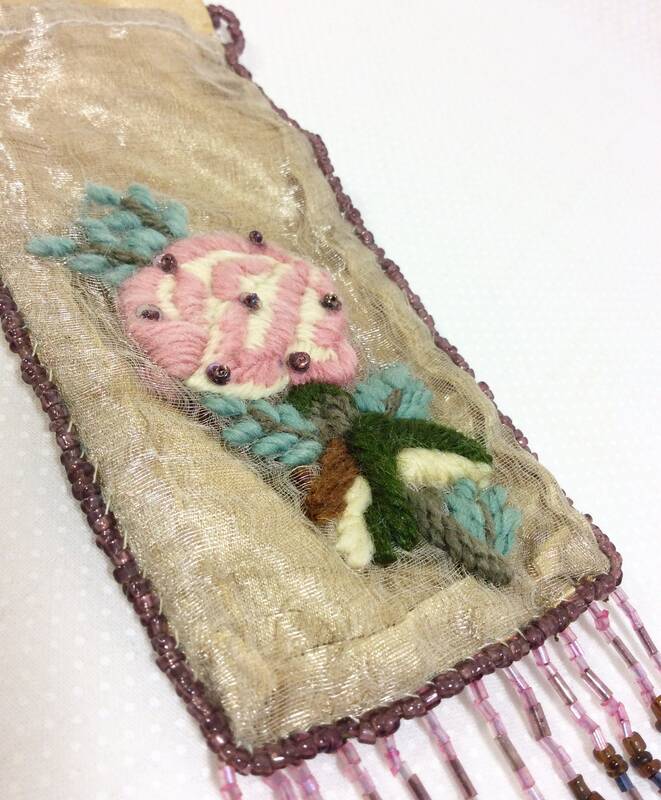 The front is made of raw Chinese silk, with an embroidered pink flower. 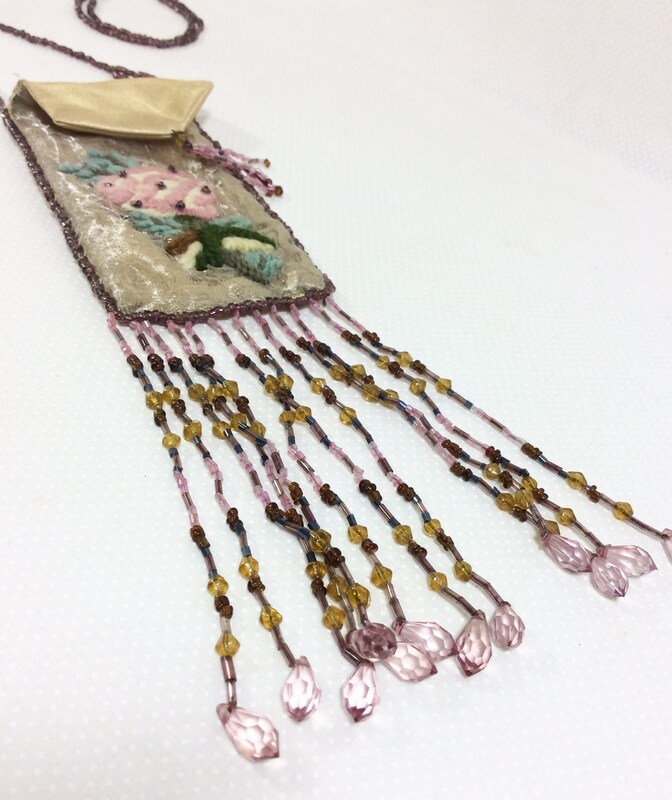 The flower has green leaves and purple beads sprinkled throughout, showing off the love and craftsmanship that was put into the creation of this piece. The back side of the pouch and the front of the flap are made from a shiny metallic gold satin. The flap comes to a point in the front, which has a sweet little cluster of four strands of beaded fringe attached. The crystal glass beads throughout the necklace are also quite breathtaking. 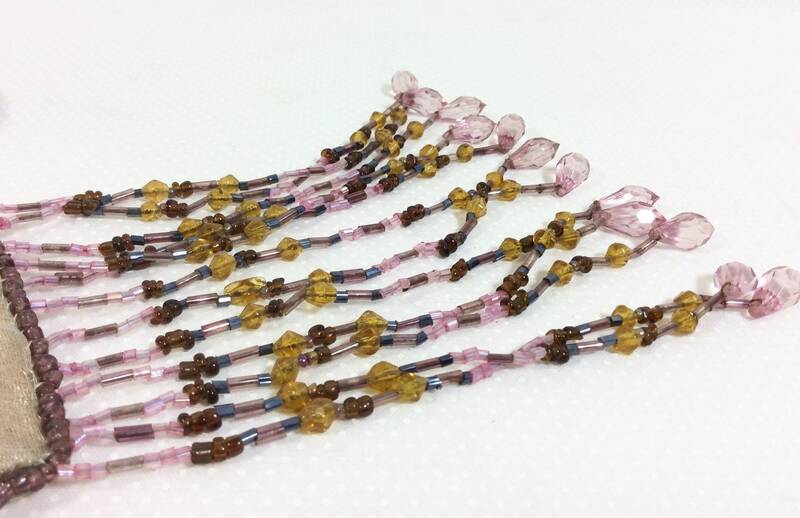 The long necklace strand is made up of tiny amethyst purple glass beads. 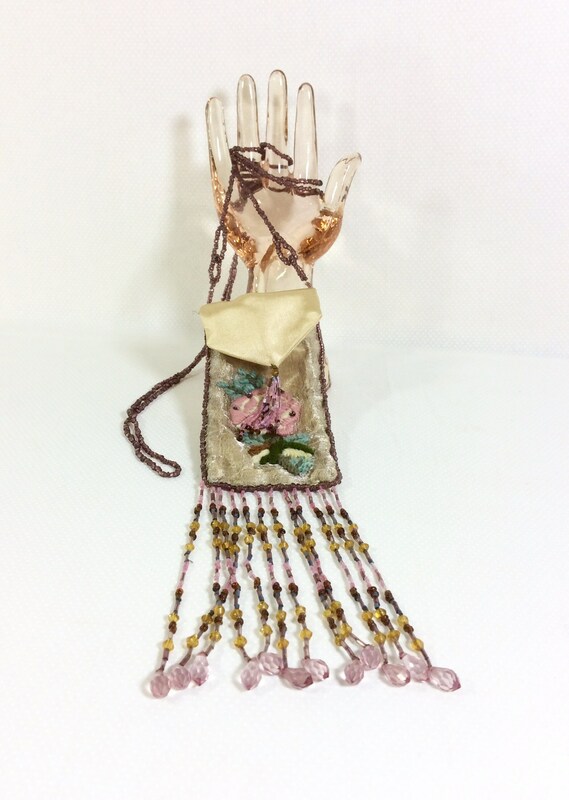 There are a couple small beaded loops on each side of the necklace strand (next to the pouch) to add extra strength to the long and delicate strand. 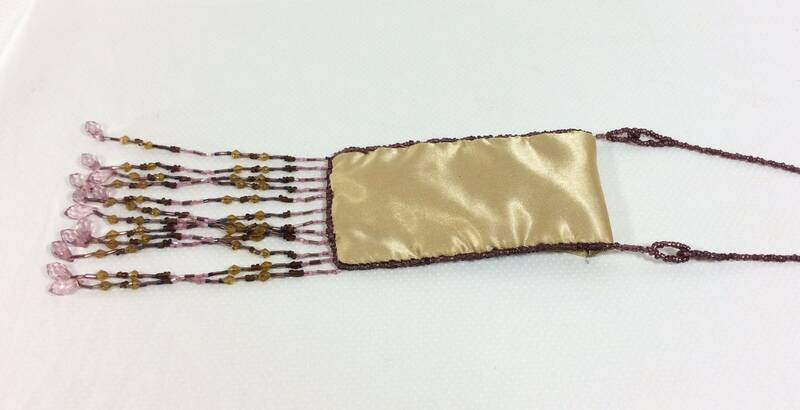 The same small purple beads border the silk pouch, continuing the elegant look throughout the design. The crystal beaded fringe at the bottom of the purse measures five inches long and is composed of at least ten different types of beads. The beads vary in size and color, ranging from amethyst purple, to translucent pink, and golden yellow. The most striking beads however, are the crystal pink bugle beads on the very ends, which are slightly heavier and keep the pouch weighted down so the fabric does not curl. The body of purse measures 5.5 inches long, by 3 inches wide. 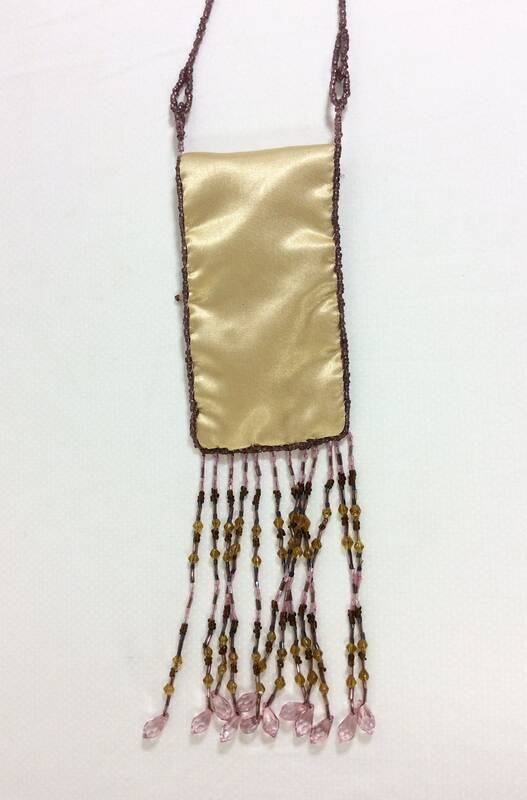 The total length including the bead fringe measures 10.5 inches long. The beaded strand hangs approximately 26 inches long when laid out flat, and can be wrapped around the neck a few times if a shorter strand is desired. This item is in excellent vintage condition! There are no stains, holes, pulls in the fabric, or missing beads. This piece would look lovely on screen for film, or an incredible addition to your collection, or could be a stunning and unique wedding accessory! Gladly accepts Paypal and credit/debit cards. Processing time between the date of purchase and shipment is 3-5 business days. Items ship 1st class US Mail with tracking, which usually takes 3-5 business days. I am happy to ship outside the USA, but do not offer tracking on these items unless previously requested by the buyer before purchasing. The main reason for this is because it is quite expensive to track international packages, but I am happy to work with you on an individual basis. Upgraded shipping to priority express, and gift wrapping services/ pricing available upon request. Refunds will be honored if the item is returned within 14 days of delivery date. The cost of the item will be refunded upon receiving the returned item back in the same condition as it was shipped. Shipping costs are non-refundable. Sale items are non-returnable. Refunds can be issued for purchases paid via PayPal, but please note that the paypal transaction fee is non-refundable and will be deducted from the refund amount. *Please note that this seller does not accept returns/ refunds on items in which the authenticity of materials or time period is in question. We do our best to provide correct information to the best of our knowledge, but occasionally things to slip through the cracks unintentionally. Thank you for your understanding.